Various colorants. Such as beets, yellow and red onion skins, red cabbage, blueberries, turmeric, coffee, and just about anything else you would like to experiment with. Get creative and have fun! Cheese Grater. You’ll use this to shred your veggies. White Vinegar. You won’t need much, only about 1 tablespoon for each different colored dye. 18 eggs. (or however many you would like to make, you can fit about 3 eggs in each dye you make) I used a mix of white and brown eggs just to see what different colors I could produce using the same dye. 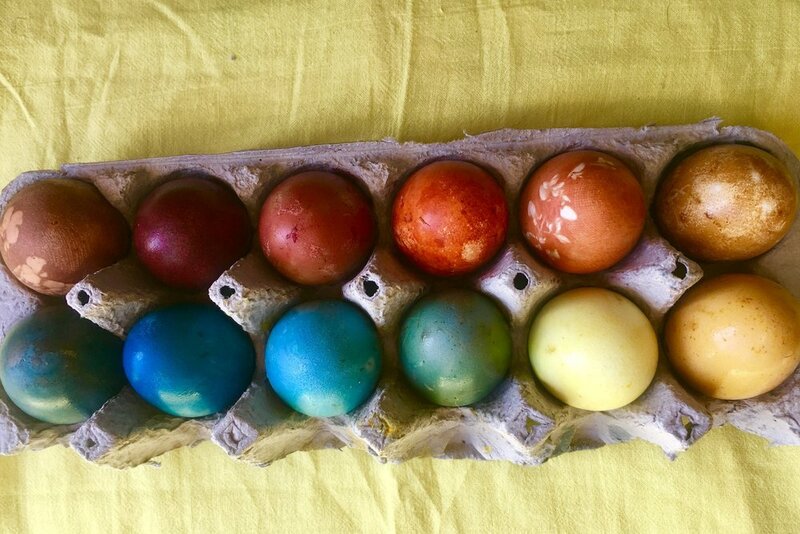 For example, the cabbage dye turned the white eggs a gorgeous blue and the the brown eggs a mellow green. I would suggest putting one brown and one white egg in each dye you make to end up with twice as many colors! Pans for boiling your dyes. I ended up using all four burners and it took me about an hour and a half to finish all of my dyes. Strainer. You will need this to separate your colorants from your liquid dye. 8-Quart Sized Mason Jars. Just about any container will work, but mason jars were by far the most effective and easy to use. You can use any size but the quart held all of the dye and 3 eggs. Egg Cartons. Cardboard egg cartons make a great drying rack. Cheese Cloth and String (Optional). 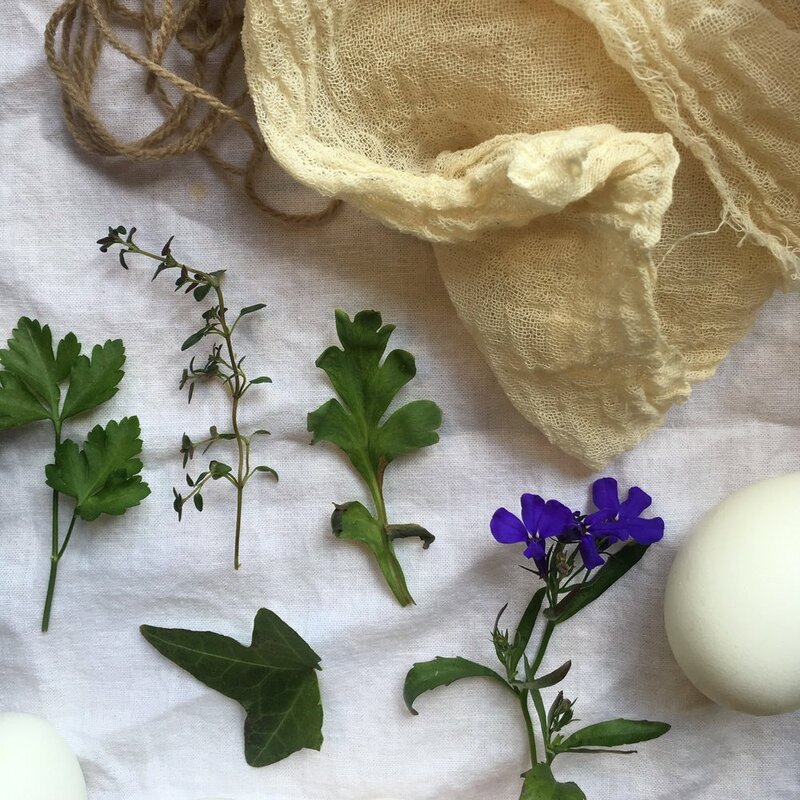 If you feel like taking your naturally dyed eggs a step further, you can create beautiful designs using flowers and leaves. I’ll explain that process below. You can test your colors as they boil to see if they are vibrant enough. Place a drop or two on a paper towel. The color that shows up on the paper towel is not necessarily the color that your egg will turn, but it will give you an idea. Keep at a medium high heat for at least 30 minutes. Make sure it is not an extremely hot or rolling boil, or you will boil off all of your liquid. It should be gently bubbling, stir often. After you are pleased with the color you have produced, strain the colorant out of the dye and put the liquid dye into a mason jar to cool. Let your dye cool for about an hour. Add one tablespoon of white vinegar to each jar, Assuming each jar has 3 cups of dye. 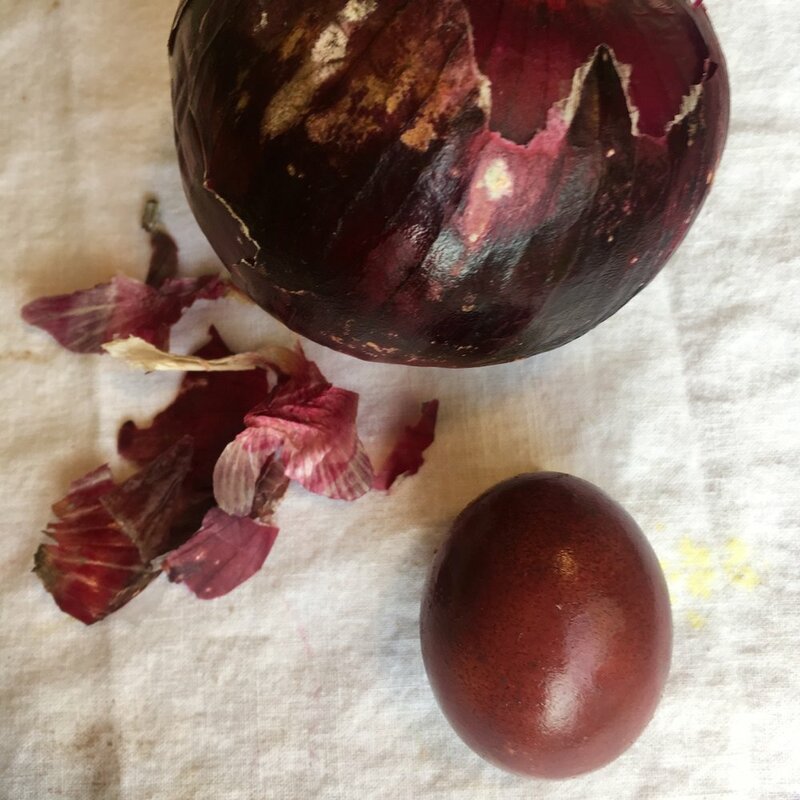 Carefully place hard boiled eggs in dyes. Seal jars and put in fridge. Let eggs sit in dye over night*, occasionally tilting the jars around to rotate and move the eggs to ensure an even dye. Once removed let dry in egg carton. Wow everyone with your gorgeous, all natural, homemade Easter Eggs!! You can try all different kinds of colorants. I played with many different fruits, vegetables ans spices and was pleased with most of the results. The ones I have shared were my most successful, but don’t be afraid to come up with some of your own dyes! Remember to use different colored eggs and various time increments to make a whole rainbow of colors! Blueberries. Use a cup and a half of fresh blueberries. Mash them as much as possible. After you boil them make sure to strain them thoroughly. The less blueberry bits in your dye, the better. Yellow Onion Skins. Peel the outer skins off of about 5 yellow onion. Loosely chop the skins. Beets. Shred one to beets to you end up with a cup and a half of shredded beets. Red Cabbage. Shred half of a red cabbage to end up with at least 2 cups. Coffee. To make this color with coffee you just have to brew a strong pot. Skip the boiling water steps. Red Onion Skins. Just like the yellow onion, use the skins from about 5 onions and loosely chop them before adding to the water. Turmeric. Use 3 tablespoons of powdered turmeric. If you have a juicer, use it to juice your blueberries as opposed to mashing. Do your best to separate the turmeric powder from your dye. Once again, if you have a juicer, I would suggest using it to juice fresh turmeric for a more vibrant yellow. Work on a non-wooden cutting board. All of these colorants are quite strong. Everything they touch, including you, will look like an Easter Egg. That being said they are completely harmless so its okay to be a little messy! If you’re feeling fancy, you can leave imprints on your eggs with a few simple materials. The end result is a delicate silhouette on your eggs. Have Fun! 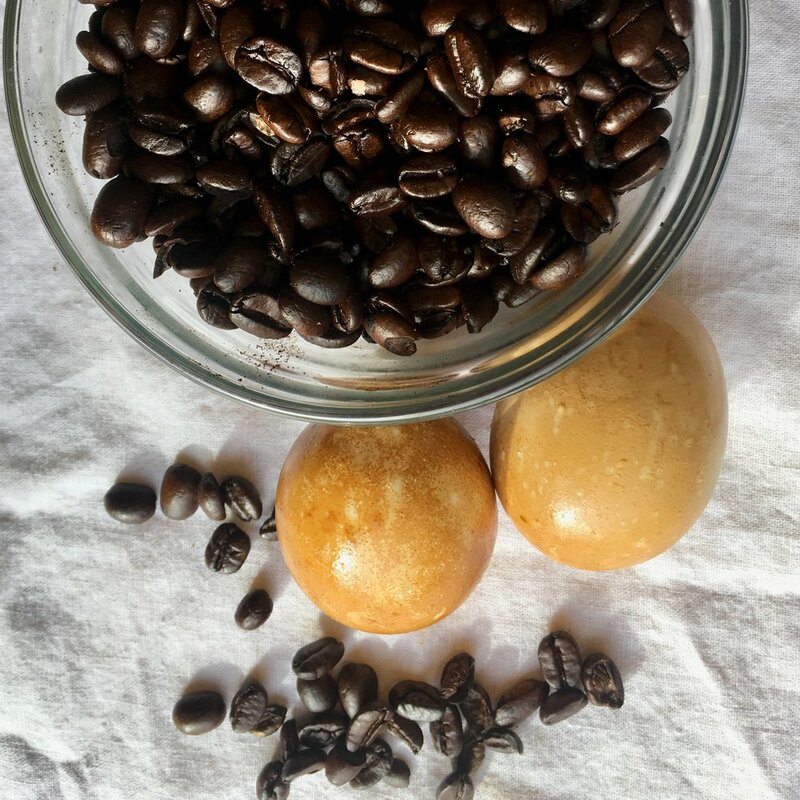 This is a relatively easy step that adds a beautiful finishing touch to your naturally dyed eggs. Flat, broad leaves is what I found to work best. Arrange the flowers or leaves so that they lay flat and pull the cheesecloth around it as tight as possible. Tie in place with the string and add to the dye normally. I suggest using the more vibrant dyes for a deeper contrast.